Heat oven to 350°F. In large bowl, mix potatoes, soup, sour cream, milk, broccoli and onion. Spoon mixture into ungreased 13x9-inch (3-quart) glass baking dish. Cover with foil; bake 30 minutes. Meanwhile, in 12-inch skillet, heat oil over medium-high heat. Add 3 of the pork chops; sprinkle with half of the salt and pepper. Cook 3 to 5 minutes on each side or until pork is browned. Repeat with remaining pork chops, salt and pepper. Remove foil from baking dish. Place pork chops evenly on top of potatoes, overlapping slightly. Bake 25 to 35 minutes longer or until edges are bubbly and pork is no longer pink in center. 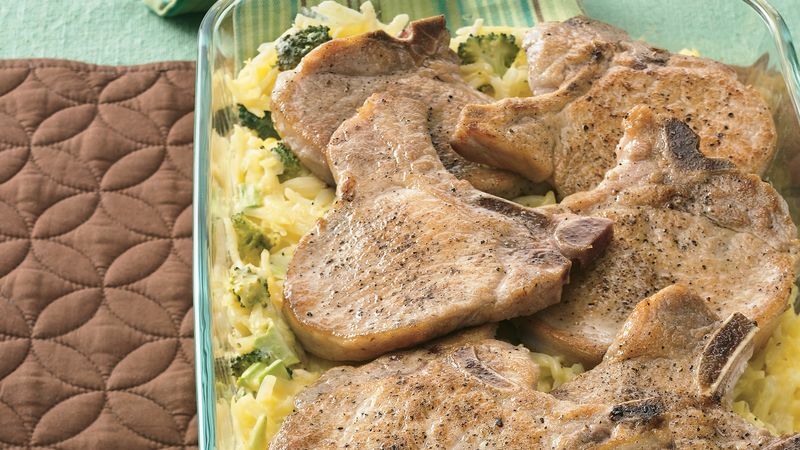 Skip the pork chops, and this casserole becomes a tasty side dish. Next time, try substituting 6 boneless skinless chicken breasts for the pork chops.